DSSSB Post Code 61/15 Grade – IV DASS Tier 2 Admit Cards Out - dssb grade-4 dass tier 2 call letter, hall tickets released, download now. 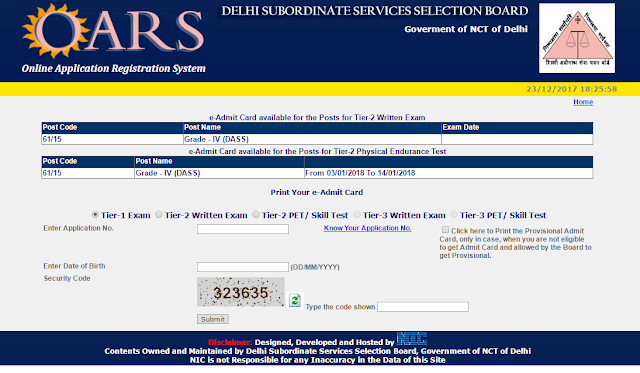 Delhi Subordinate Services Selection Board (DSSSB) has released the exam date for the post of LDC post code 61/15 in the advertisement number 1/15. DASS Tier 2 Admit Cards are out for DSSSB Post Code 61/15 Grade – IV. You can check your admit card by entering your Tier 1 Roll. No. Dates for Physical Endurance Test also Out.